From the delivery of the first units in the late 70s, up through their phase out in the mid-to-late 90s, General Motors' Electro-Motive Division's F40PH was the workhorse of Amtrak's passenger service. 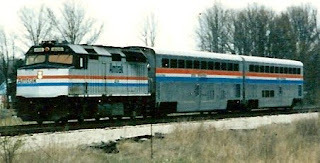 When the photo below was taken, Amtrak was in the process of rolling out a fleet of General Electric P40BH (or AMD103, depending on whom your talking to) locomotives to replace the F40s. Below we see Amtrak F40PH 406 pulling a pair of Superliner cars. The scene transpired on an overcast April afternoon in 1995 at Chesterton, IN. The line, I believe, is an ex-New York Central line that was spun off to Amtrak by Conrail, and my guess is that this train is one of several dailies that rain between Detroit and Chicago.